As the first action camera by Olympus, the TG Tracker with its camcorder like design looks quite different from other action cams like Go-Pro. Olympus which has been manufacturing rugged cameras for quite some time has finally come up with this experimental camera which is packed with features like the high speed F2 lenses, superior field sensor system, ultra HD 4K30P video capture, and 204 degrees FOV on land and 94 degree FOV underwater. This fully waterproof and shockproof camera comes in 2 different colors- the regular black and a bright green color. Measuring about 35x 56x93 mm and weight approximately 180g this compact cam is just a little heavier than the GoPro Hero4. On the left side of the cam you will find a flip out screen about 3.8 inches. The sturdy built of this camera along with the inbuilt image stabilizer greatly helps in reducing the vibrations. There is a tiny LED lamp which can help you shoot in low light conditions- a whole new feature in action cameras. The TG tracker is totally waterproof to 30m, and all the buttons of this cam are totally sealed and the battery, SD card slot, HDMI port and USB port can be accessed through a hinged door right on the rear end. 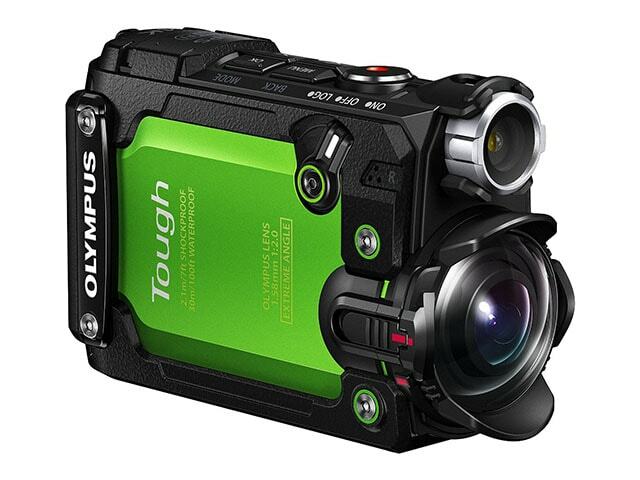 As with the other tough range cameras by Olympus the TG tracker is meant for rough use. Apart from being fully waterproof it is functional in temperatures of -10 degrees, drop proof, shockproof, crushproof and even dustproof. The built in GPS, accelerometer, thermometer and nanometer would give you all sorts of additional info about anything you want to do with the cam. With a wi-fi connection you would be able to connect the cam to an Android or iPhone and make use of apps like OI share, and OI Track. On the top of the cam you will find 5 buttons – one for shutter release and video record and 4 Menu buttons along with the Info, wifi, mode and back buttons. Just hold and press the wifi button to access wifi and the connection can be set up easily by making use of the QR code which can be seen on the cam’s screen. The product bundle is surely going to impress you. Apart from the cam you will be getting one protector for the lens, one underwater lens protector, a mount coupling attached with a selfie mirror in the front along with a pistol grip handle which can be attached to the mount coupling. Apart from this you get the strap, USB cable, charger and the battery. The TG Tracker can be charged while using with the case off. This can be really helpful in situations where you have run out of battery. Most standard Go-Pro accessories are most likely to fit the TG Tracker. Moreover, you also get to choose an optional holder which can be attached to the strap or belts and comes with a spiral safety cord to prevent any drops. This camera is mainly used for shooting videos and you will be getting 4K full HD video along with 720p options. At 4k/30fps you will be getting approximately 6 minutes videos because the size is limited to 4GB. When you reach the 4 GB limit, you can make use of the loop setting to make a new file. Though it’s a tiny sensor camera, the video quality is rather good. You can see excellent slow motion action when the high speed recording is played at a speed of 30 fps. However the only limitation is that you don’t get to record any audio while shooting high speed frame rates. The TG tracker allows the user to select from more than one FOV. When you switch on the electronic image stabilizer, then you get to lower the field of view. This feature can come real handy for lowering the shakes. The TG Tracker is not meant for recording stills but videos. One downside of this camera is that you don’t get to take a still shot while recording a video. It comes with limited features for still photography and you get to choose from just a few basic settings. The tracking capability of this camera is what makes it stand out from its competitors. The TG Tracker is capable of recording the height, underwater depth, acceleration, orientation and the temperature with the help of its 5 inbuilt sensors. You will be able to see all these data on the graphs so that you get to see a snap taken at a specific altitude or at a certain area on the map. These sensors also enable the cam to perform 2 other tricks. Firstly, whenever the accelerometer traces any abrupt change in equilibrium, a chapter marker will be shown in the videos. The TG tracker can also detect whenever the cam goes underwater and sets the white balance automatically. The field sensor system input of the TG Tracker would let you record data continuously just like some cameras are capable of recording an uninterrupted GPS track log. The TG Tracker isn’t just going to record the location, it would even tell you about the direction you are heading to, your speed, your altitude and even the temperature at any given time. The Field Sensor System comes with a temp sensor, a sensor for barometric pressure, an electronic compass, and accelerometer and of course a GPS. The accelerometer would automatically tag the footage with chapter info so that you can easily rewind and forward it to view the interesting parts. The GLONASS and QZSS are capable of calculating the exact latitude and longitude of the user. The 1350 mAh battery allows the camera to shoot for 90 minutes at a stretch. It can be charged with the standard micro USB cable. The battery capacity is slightly bigger than any other normal battery. The TG Tracker stores all the videos and other info on the SD card be it Micro SD, the greater capacity SDHC or SDXC or ever the high speed USH-I ones. As already mentioned above, this action camera is shockproof, dustproof, freezeproof, drop proof and waterproof. It is capable of withstanding a drop from 2.1 meter height. Being crushproof implies that the camera will be able to withstand a weight of about 100KG. Since its dust proof you can always take it to the beach whenever you want to and just wash the grains later. It is waterproof up to a depth of 30 meters and being freezeproof it can function at temperatures as low as -10 degree Celsius. The camera can be connected with any mobile devices with the help of Wi-Fi so that you and enjoy apps like OI Share and OI Track. OI share is the image sharing app by Olympus which helps to transfer, edit and remote shoot the images. The OI Track is another Olympus app which helps to track any kind of activity the user is doing like- hiking, running, diving, running or climbing. The track logs are downloadable from the TG Tracker and the GPS assistant data can be downloaded and updated from your phone. This camera comes with all the features you would expect from a high range action camera. The built in wifi connectivity, 4K video, the 204 degree lens, the impressive 120 fps, the 5 sensors and the Olympus image apps make this camera one of the best in the market. The sturdy build of this camera is what sets it apart from any other action camera in the market.